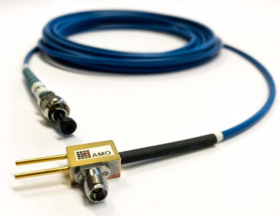 Researchers at AMO GmbH have used Oxford Instruments Plasma Technology’s fabrication solutions to develop a graphene based photonics device capable of operating at a data rate of 25 Gb/s per channel. These devices convert optical modulation data into electrical signals that are compatible with electronics-based IT systems, unlocking data streams at ultrafast speeds and large bandwidths, thus becoming a key enabler for the next generation of mobile communication. The devices were developed at AMO’s 6” device fabrication pilot line equipped with Oxford Instruments fabrication solutions which includes ICP RIE, ALD and PECVD tools. Oxford Instruments offers reliable and high performance solutions for the data communications market sector for both scaled-up production as well as novel device R&D. The detector fabrication solution includes: waveguide fabrication, III-V/2D materials mesa etching and graphene/2D/novel materials deposition. In addition Oxford Instruments also offers a range of solutions for devices such as the InP edge emitting lasers and VCSELs that are also key components of photonic data communications.